A leash is an essential part of your paddle boarding gear, but with so many types of SUP leashes on the market, it’s hard to know which one is right for you. 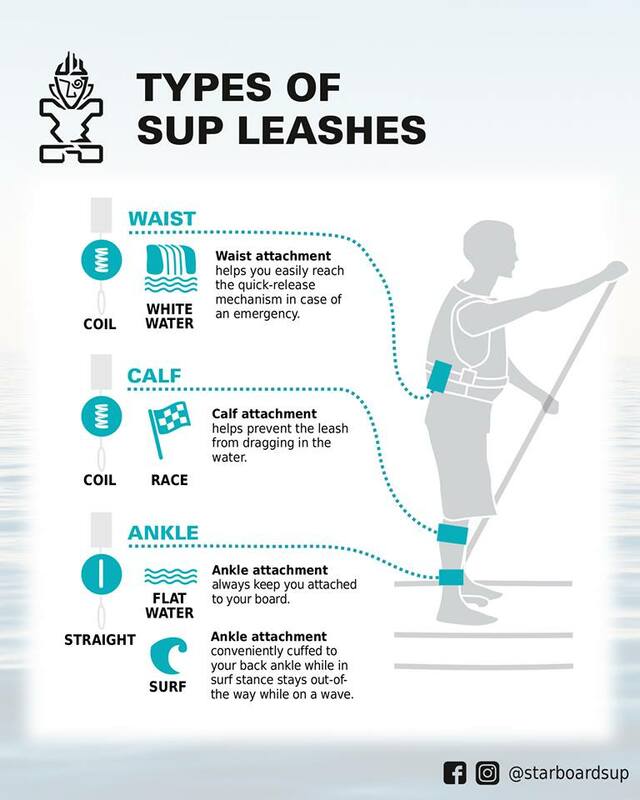 This handy infographic will break it down each category type of SUP leash by waist, calf or ankle attachment point. A waist attachment leash helps you to reach the quick release mechanism in case of an emergency. This type of leash is an especially popular option for Whitewater River SUP where the paddler may require an easy release leash if they get caught up in river strainers or obstacles – like trees, rocks or even bridges. The coil leash will be attached to their Personal Floatation Device (PFD). Another use of the waist attachment leash is seen in paddleboarding is for SUP racing. This is popular for the same reason that the quick release mechanism is easily reachable, very handy for when it comes to the final dismount and sprint to the finish line in Technical Beach Racing format. Note, typically you would need to mount the leash to your PFD. The calf attachment leash is the most popular type of leash used in Stand Up Paddleboard racing. Having the leash connected to the calf helps prevent it from dragging in the water and also keeps it out the way and preventing it from getting tangled up around the racers ankle when stepping back for a buoy turn. This type of calf race leash is typically always a coil leash. An ankle attachment leash is the most popular kind of leash available to paddleboarders and is an essential piece of gear to have on before we get on the water. Wearing a leash means that you are always connected to your board, it’s so important that we even ship a lightweight leash standard with most boards in our Inflatable Paddle board range. The straight ankle cuff leash is great for all-around paddling on flat water – cruising or touring. Most beginner or first-time paddlers would use this type of leash. The ankle attachment leash is also widely used in stand up paddle surfing, conveniently cuffed to the rider’s back ankle (see Regular vs Goofy stance) so stay out of the way when catching a wave. A SUP surf leash design is much stronger and also has other features like a swivel and rail saver (the velcro section of the leash) – learn more about our SUP Surf leashes here. Remember ~ Leashes Save Lives! Always wear a leash!